Pre-order on DVD from Amazon for only $14.98 now. So much for the girls taking a nap today. Instead, they saw me move the Sesame Street: Learning Rocks DVD we received in the mail this AM, and kept asking to watch it. As soon as the DVD started playing, the girls went from rubbing their eyes and being tired to getting their second wind and dancing around the living room, without a care in the world. Oh, how I miss those days that you could lay down for 10-15 minutes and then get a second wind. "It’s time to rock n’ roll! Sesame Street and its lovable monsters help kids learn how to solve problems using music. 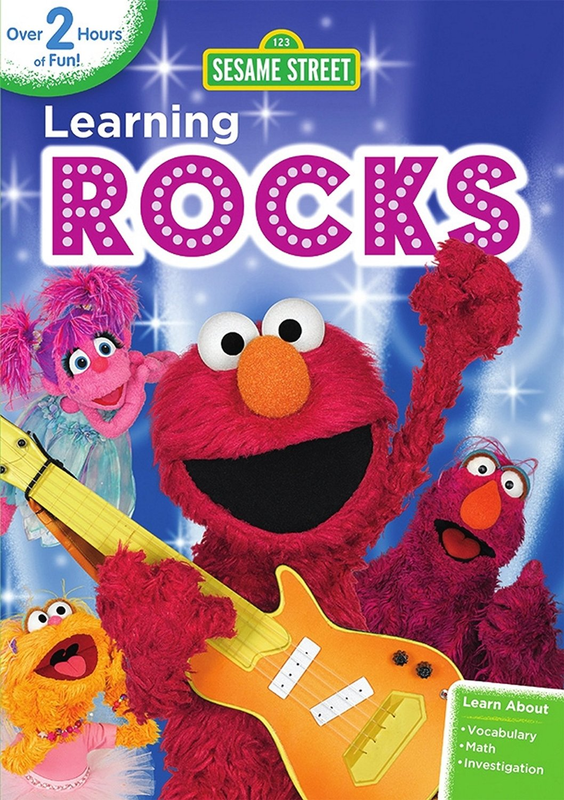 Enjoy these melodic moments when Warner Bros. Home Entertainment and Sesame Workshop, the nonprofit educational organization behind Sesame Street, release Sesame Street: Learning Rocks on DVD and digital July 22, 2014 for $14.98/$9.99 SRP. When famous rocker Virgil Von Vivaldi (Michael McKean, playing a spoof of his This Is Spinal Tap character) shows up on Sesame Street, it is up to Elmo, Abby, Zoe and friends to use their creativity to make a new rock band for Virgil. The catch? Virgil’s wants his “rock” band to be made entirely out of rocks! Elmo and friends take on this fun challenge and set out on a quest to find the perfect rocks for Virgil. They identify each rock they come across and study its characteristics to decide how it can be best used in the band. First, they find a tiny pebble that they realize is too light to be the lead singer, but can be the tambourine player instead. Elmo then spots a heavy rock that he determines will play the gong. Zoe then meets Rocco, whom she identifies as a basalt rock, a type of igneous rock that was formed by a volcano. Because basalt rocks have many holes, he too cannot be the lead singer, but can be the bass player. Next, Elmo finds a limestone with fossils in it that will be the flute player. Zoe finds a shiny rock called obsidian that can play the oboe. Then, Abby finds marble that is sparkly and colorful and can play the mandolin. Still in search of a lead singer, Abby changes Vergil into a smooth, sparkly rock called a gem. With all the pieces in place, it is finally time to rock on!" The DVD includes another full episode that features Donald Glover from the hit show, "Community" that my husband and I watch, who plays the rock star LMNOP (a spoof of the musical duo LFMAO). He is all set to perform for the kids on Sesame Street, but has lost his equipment. Instead of cancelling the performance, Telly and friends must work fast to create replacements in time for LMNOP's big show. Here is the fun clip showing how Donald Glover got create by using a lampshade as a microphone and a cardboard box and elastics for a guitar. I can't want to hear what you and your children think of this new DVD, which will surely come in handy for rainy days and long car rides this summer and beyond. So, don't forget to make a point to pick it up or pre-order it now, as it releases on DVD on July 22nd. Thanks to the kind folks at Warner Bros. Home Entertainmet, three (3) lucky readers will win a copy of the new Sesame Street: Learning Rocks to share with their child(ren). To enter, please complete the entries on the Rafflecopter form below. Good luck!